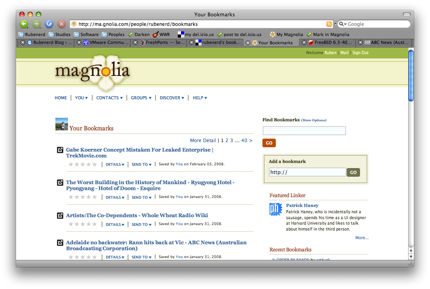 Magnolia is a similar social bookmarking site to del.icio.us with one important difference: Magnolia isn't being bought by Microsoft! I love del.icio.us and have been a loyal user ever since I heard about the service on The Gillmor Gang in 2004, but Microsoft's threat to buy Yahoo means I need to say goodbye. The first step is exporting your years of accumulated links from del.icio.us. 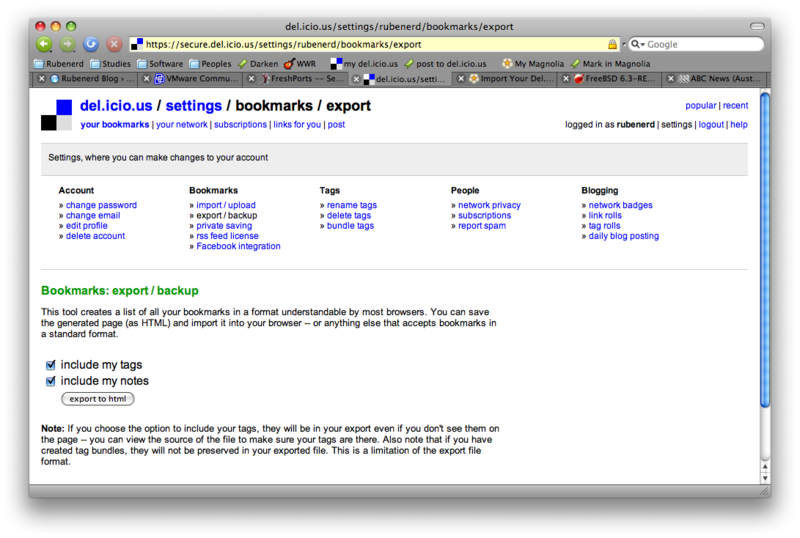 From your home screen, click Settings, then under the Bookmarks heading click Export / Backup. You'll be given the option to export all your data as HTML which you'll save to your local drive. Once you have this HTML file, you can register for a Magnolia account and import your data. 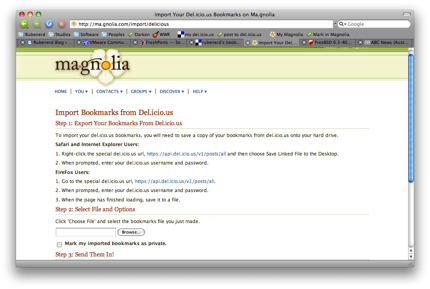 From your Magnolia profile page, click Help and choose Import from del.icio.us from the popup menu. 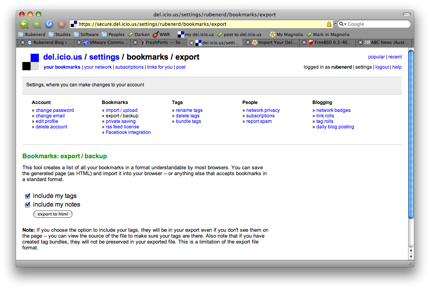 From there you browse for the exported del.icio.us file and Magnolia will begin importing. 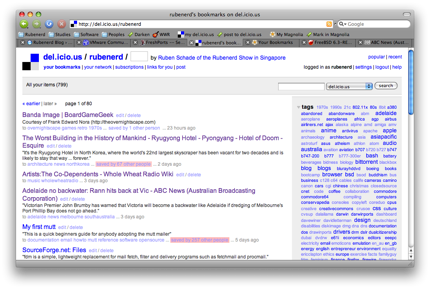 My links took just under 5 minutes to import. After you've got all your links in, you'll want to add the Mark in Magnolia bookmarklet to your browser bookmark bar. It works in the exact same way as the post to del.icio.us link you probably used. 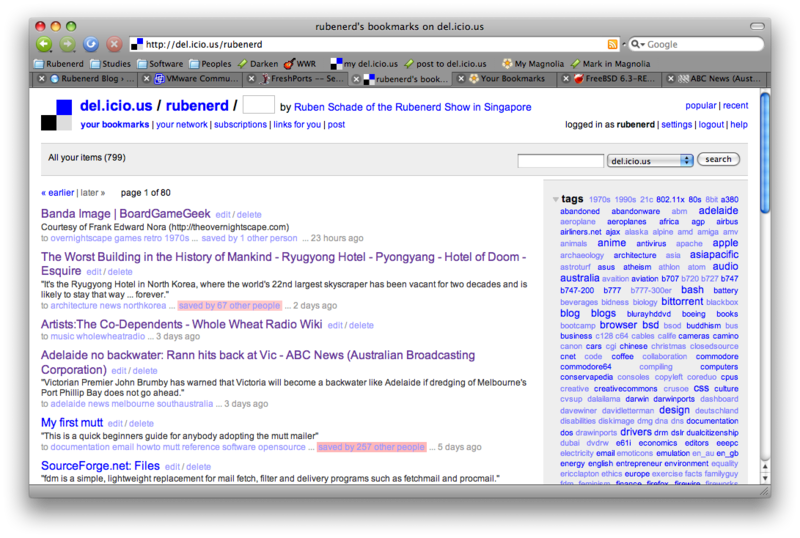 The Bookmarklets link is also in the Help menu. And there you have it, not really that hard at all. It's ironic that one of the features that drew me to del.icio.us in the first place (easy data export) was the one feature I was hoping I would never have to use. I'll stick to using both for now, but it's good to know I have a backup plan if Microsoft does end up getting their hands on it.